Do you mean 5.2? It definitely locks up when you try to add them to a Beta 30.1 database. Ok, just PM me, and I can have advanced support help you. The issue is that if you tried with an older version, and then you update to a new one, it won't work. It's because the tables were already created in the database, and because of the PT3 structure, you can't just re-add the filter table. If you are doing a clean and new install, it should install with no issues. 1. I just payed for leakbuster via creditcard. I use PT3. How/when do I get the registration code? Reading the manual I'm a little confused. I know it's written for HoldEm manager version but the registration process/screen looks different. Is there a waiting period before I can expect the registration code by email? I have gotten a payment recite so far. 3. I play partly on FullTilt and it's for the games there I feel I need to adjust my games. I also play on another site which is 10 handed instead of 9 handed. Does this make all of the stats unusable for that site or are some more 'correctly' usable than others? 1) No, you should get the registration immediately after payment. Check your spam / junk mail box also. It's automatically sent out, but if you didn't get it, just let me know. 2) For PT3 this is correct. It's for your default username you are currently using in PT3. 3) Leak Buster will adjust for 5/6 handed games and 9/10 handed games. If you score a 6 in a particular area, it's going to be leak on any site you play. So my best short answer is it will make you aware of your biggest leaks without question. 4) The default resolution is 800x600, which is the most common minimum resolution size. Leak Buster will not shrink if you minimize screen size resolution because we found it impossible to be able to read the content in any any smaller size, and fit all of the info that Leak Buster is doing. I guess we don't commonly have people moving between screens. I can talk to the developer about this, but I do know that they had played with several different resolution formats. 1. Sent you a PM. Nothing in my spambox. 4. The problem isn't so much the 800x600 (although I kinda doubt many play poker on a screen that small these days). It's seems that when it opens up on one screen (and I seem to be unable to choose which screen it should open to) it makes a window the full screen size. Most of it empty. I played with it a bit and it doesn't seem to happen when it opens on the other screen. I'll see if I can figure it out. Either way a resizable window would be better. I PM'd you with more information but the lock-up happens when you try to add them to a remote database. Check your PM box, because we re-sent you the serial number. I think you were looking in the wrong address (based on your e-mail to us). It's really hard to say much without actually seeing your setup. It sounds a little unique. I'll talk with the developer about perhaps a way to enlarge for bigger resolutions (a min.max button), or something to that effect. Ok, great because I'm not sure what you mean by remote database. Thanks. I want to buy leak buster for PT3. But I have some problem with connection to PT DB on trial version. [1/26/2010 2:22 PM] NOT Found in Program Files. [1/26/2010 2:22 PM] NOT Found in Program Files(x86). [1/26/2010 2:22 PM] Searching in Program Files(x86). [1/26/2010 2:22 PM] Not found in Program Files (x86). [1/26/2010 2:22 PM] Path not found. [1/26/2010 2:22 PM] Filling OK.
[1/26/2010 2:23 PM] Filling OK.
You are not trying to import cash game data, or you have the wrong database selected. This is the name it's defaulting to. If you have another database with cash game information, then you need to goto file -> database -> PT3 and choose your database. "Both HM and PT3 are not installed." Maybe this was mentioned already but I just think this is because my HM isn't installed in the standard directory. Which is kinda fail. Oh nevermind, it's integrated with HM already. My bad. When I import this hand in HM database everything is ok. But I like PT and want to use LB with PT. LB looks in the default directory, but then it checks the registry as well. And I think there is some other check (not 100% sure). Make sure that you also have the correct alias selected in your PT database. What does it mean "correct alias"? I assume this means you need to have configured "My name is" in the Settings Window. I very disappoint, because LB for PT have only videos how to find leaks with PT3. LB for HM is much better how I understand from trial. Could I exchange my registration number on registration number LB for HM? 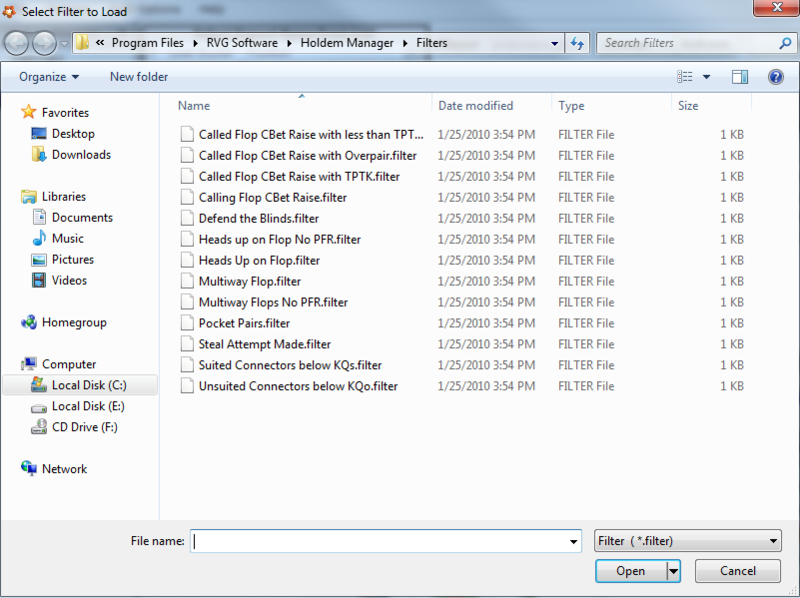 I'm going through the 6th step of leakbuster (filters) and when I go to my cash game tab and try to load the filters, many of the ones don't show up. Is there any way I can download these somewhere? Here is a screenshot of what I'm looking at. I just tried to do the top pair filter and it doesn't exist. Well, that's not all it has, but yes the HM version has a lot more features. No problem though, just PM me with your e-mail and reg number. Some systems the cache doesn't always reset. So if you just registered, and you haven't exited and re-started HM, then the filters may not be there. Just exit and re-load it, and it will build them for you. P.S. They can also just be run in step 6. You're welcome. And also note that in step 2 you can click the filter button, and it will open up the relevant filter for that leak. Then just double click on the filter and it will load it up in step 6 for you. And you can run them manually like you listed as well. Changing the date of the workshop. We overlooked the importance of the Super Bowl, so we've bumped the date back a couple of days. All Leak Buster customers will get an e-mail with this information, and if you can't attend, a video link will be sent to you. About the workshop: We'll be doing a live interactive workshop about how to use Leak Buster, how to get those most out of it, and talking some poker theory as well. It's Free and available for anyone to attend. I send you message. Please reply.